Carding mills only. Ground plan of length:width as 2:1. Four or five storeyed. Simple gable or hipped roof. Rows of windows on each floor. May have tall, long, thin building attached later as beam-engine house. May have a teagle (external lift running in a small square stone shaft attached to one gable). Fewer windows in the flax mill. Similar to cotton mills in general appearance, but only three floors. Both woollen and cotton mills often had a roof-ridge belfry. No teagle on woollen mills. These were, almost without exception, two storeyed buildings of simple gable-roofed pattern and with rows of windows always on the upper floor and sometimes on the lower floor. There was also a series of drying sheds close by, usually pillared on one side to allow air to blow freely around the timber stacked therein. Some of these ‘coppice’ sheds were two-floored, most used the ground floor only, open to the roof. Pillars built before 1850 were of dry-stone and round in cross-section, those after were square or rectangular – though why, we do not know. Square, dry-stone stack with tapering sides, about 30ft high and topped by small square structure. Stack usually built against a bank for ease of filling. Various outshuts leaning against the stack to provide cover for waterwheel, air pump and casting floors. Often the space from top of bank to top of stack covered over by a gable-roofed shed. Large two-storeyed gable-roofed barns of roomy proportions nearby to hold charcoal and iron ore.
Single-storeyed gable-roofed buildings with dissimilar roof pitches, the shorter roof having the steep pitch. Often two or more waterwheels. The whole site was a long and thin one to scatter individual buildings behind embankments and bunkers. A long head race runs parallel to the river. Area of dense trees. Of the other types of mill in Cumbria, the snuff, tanning, paper and mine-crushing mills are not so easy to identify from their buildings alone. Tanneries had many tan-pits, but these were so dangerous that they were usually filled in as soon as the works closed. This may sound a bit strange, but I have been fortunate to discover what must have been a regular rule of thumb for builders in the 18th century. If your mill is down to knee height, that is with the foundations complete, first pace their length and breadth. If the proportion is 2:1 then it was a textile mill. Buildings of 52ft by 26ft were built between about 1740 and 1785; those 62ft by 31ft were constructed about 1785 to 1805; those from circa 1805 to 1830 were 66ft by 33ft, and after 1835 they continued to increase in proportion, so that mills dating from about 1860 were about 96ft by 48ft. The research work that led to these findings was arduous, and the written proofs will have to await a book on textile mills of Cumbria, but I have found a remarkable accuracy from Carlisle to Manchester. Recent cotton mills may reach over six floors, but none exist in Cumbria. But some of the larger corn mills in the county were three or four floors, and several of them occupy mills that were originally built for textile production. For example, Rash mill in Dentdale was at first a woollen mill. This leads me on to a further process of identification. The mill may not have been used for its original purpose. Knowing the ‘pure’ types of building, and using trade directories, we should be able to identify our mill with some certainty, but mills were often altered or part demolished and rebuilt. As far as I know, not a single mill building in Cumbria can be proved without a shadow of doubt to be the original structure built before about 1700. A datestone proves nothing, as it can be added later. 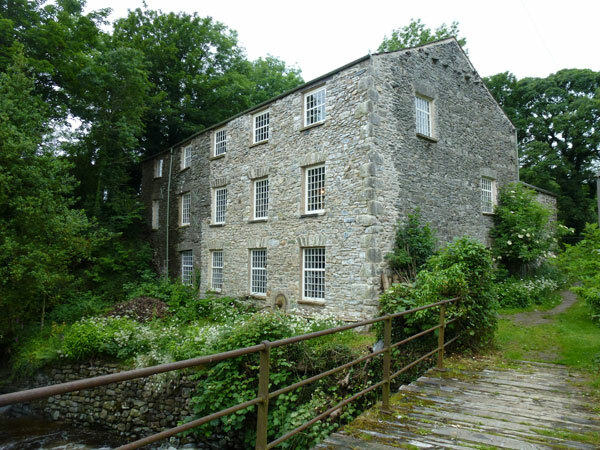 Few mills that stand today in northern Cumbria were built before 1725. Early mills would have long ago been enlarged several times over if they didn’t actually change their usage and appearance altogether. Paper mills from circa 1640 and fulling mills from earlier times have not survived at all. A very few of the early cotton mills from about 1750, and woollen mills from about 1790 that were in very isolated places survived, but all larger and better placed mills have been much added to and rebuilt. Luckily, corn mill characteristics have not varied much over the years, especially if they are windmills (although one windmill in Cumbria was used to make snuff and another as an iron forge).